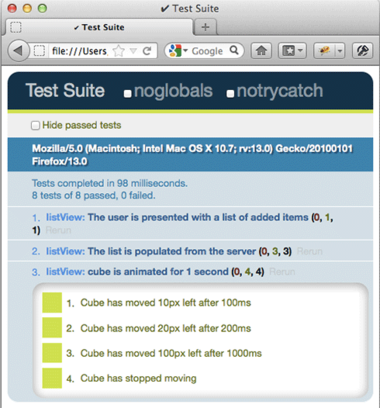 There are several mature testing frameworks out there. I have my preference, but it’s up to you to decide which framework meets your needs. First we’ll need to create a page to run our tests. 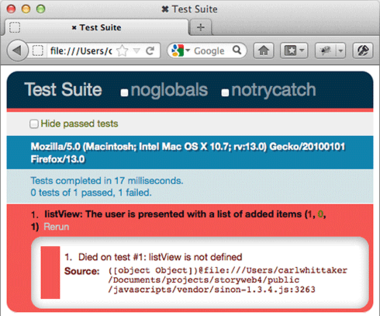 We’ll include the libraries we plan to use to write our tests. In my examples I’m going to use QUnit simply because it’s the framework I’m most familiar with and the tests are easy to read. Check out using QUnit for detailed setup instructions. You’ll also need Sinon, so head over to sinonjs.org and download it along with the QUnit adapter. 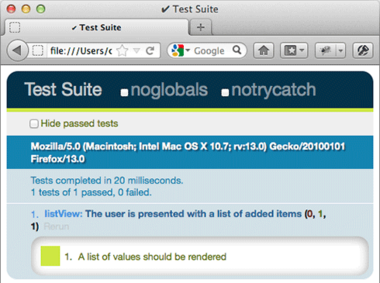 Here’s my test runner; I’ve included jQuery too because it makes it much easier to test the DOM. There we go, our first test passes. Now onto more complicated matters. We don’t want to request data from a real server. This would be slow and means we can’t test our code in isolation. The request could return at any time and our test doesn’t know when to expect it. Sinon is a collection of utterly essential testing tools that among other things enable you to deal with tricky asynchronous code and server requests. 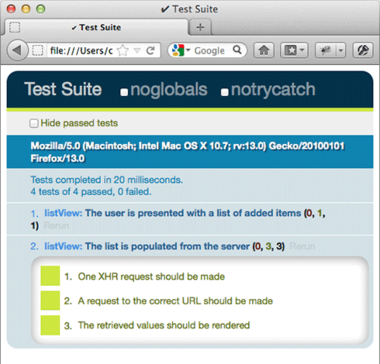 We’ve now defined a setup function for our test suite which replaces the native XMLHttpRequest with a fake one. This will intercept any attempt to communicate over XHR and allow us to define our own responses. Even better it will make our request synchronous since we’re responding to our fake request immediately from inside our test; pretty cool. Sinon.js solves this for you with fake timers. Sinon will replace the browsers’ timing functions with it’s own. This enables you to advance the clock manually and test what your code does in response. In this test we’re telling Sinon to replace the browsers timers and then incrementally advancing the timer to interesting points in our animation and asserting that the cube is where we expect it to be. 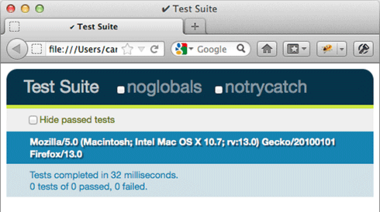 And now to run the tests. In the second part of this article I’ll write about Sinon spies, mocks and stubs.